Whether you're teaching a creative writing class or just sprinkling it into your curriculum to spice things up, it can be a little intimidating. Students often either love or hate creative writing, and the emotional investment has been known to create some challenges. An added obstacle: When it comes to creative writing, students seem to become very attached to their work. Designing rubrics? Choosing which specific writing skills to evaluate? It can all be very overwhelming. Though she's taught for over a decade, my long-time friend Lauralee from Language Arts Classroom has just begun her journey as a creative writing teacher. As any instructor knows, there's a steep learning curve when tackling a new prep. 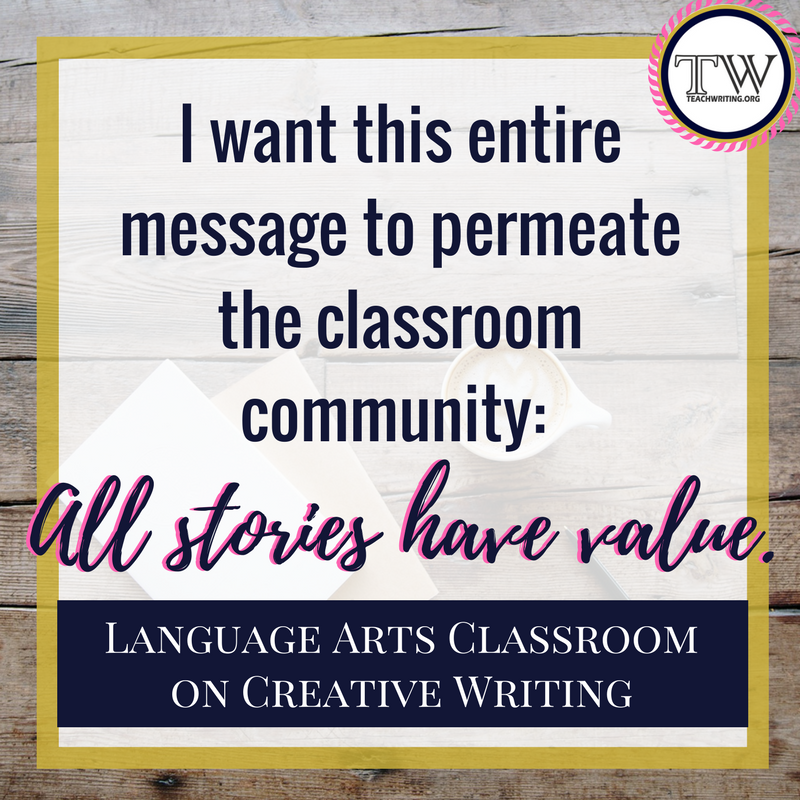 In this interview, Lauralee has graciously offered to share some of the valuable lessons she has grasped early on about teaching and assessing creative writing at the high school level. Keep reading to discover what she has to say about building teenagers' confidence, making assessment meaningful, and obtaining student buy-in. Teaching creative writing can be overwhelming. Students become so attached to their ideas and often take it personally when they earn a grade less than an A. What are your tips for building students’ morale? Immediately with creative writing students, I establish that all stories have value. I want this entire message to permeate the classroom community. My motto for creative writing students: your concept, your stories, your ideas are great; we simply must find the best method to convey them. I show students The Danger of the Single Story. I do this to emphasize that all of their stories are important. I never want to hear a single story from my students; I want them to teach me, to help me understand their experiences. Then, during lessons, we work on collaboratively forming these messages. We study humor, over-arching themes, and narrative structures. All of this, hopefully, creates the idea that I don't grade them on their stories; I grade them on their vehicle of telling it. Speaking of grading, how do you decide which skills to grade when you assign creative writing? Do you recommend focusing on all traits of writing, or on one specifically? My rubrics for creative writing take into account that this is informal writing. Students still should abide by grammatical rules, but I understand they might take liberties. I do want them to explore - will adding sentence fragments be effective? does a character use incorrect subject verb agreement? However, dialogue has punctuation rules, as does an ellipsis. We collaborate on papers, lots of conferences! Students have told me in advance when they are breaking grammatical rules. We also implement different strategies with writing. For instance, my students wrote a comedy sketch. They had to include certain elements, such as irony and 'the rule of three.' When I grade it, I'm not necessarily grading the "funniness," but rather the attempt at implementation. Some students fall in love with creative writing immediately. For others - it’s a chore. They don’t see the relevance. What’s your favorite assignment for engaging all students and encouraging buy-in to the genre? The most buy-in that I have had is with a profile activity. A "profile" is not a report on a student, and it details more than the interviewee's life. It’s not just a biography. It is not: she was born in 2000; she has three brothers. It is: she flips through her phone under the covers every night. Her parents won’t check on her, but she feels as if she should hide anyway. Through this creative writing assignment, students reveal something unknown, something deeper about another individual. I asked them to search for a "something" that defines another student. Students got to choose who they would profile. I left the activity very open; my rule was that it should not read as a report. I wanted true analysis, a larger arc about the person. I encouraged them to find minor characteristics about their profile pieces. These pieces turned out very analytical. Although I provided students with several examples, I limited the guidelines. I credit the student buy-in with allowing student choice. I didn't assign partners, I didn't provide a strict paper format, and I didn't require certain elements. And that's a wrap for Lauralee's advice. We hope her answers have provided some worthwhile inspiration and practical guidance. Looking for further ideas to support your creative writing instruction? You can follow the Pinterest board where Lauralee and I share our favorite creative writing tips, activities, lessons, assessment ideas, and philosophies here. What additional questions do you have about teaching and assessing creative writing? Please start a conversation about your questions, frustrations, struggles, or success stories in the comments. Lauralee Moss has taught English in Illinois for more than a decade. She blogs at Language Arts Classroom and posts real classroom pictures on Instagram (@elaclassroom). She lives with her husband, three kids, and crazy dog. This Earth Day creative writing project is one of many resources available from Language Arts Classroom's shop. Click on the image to read more details about this product.